As an artist with a need for an online portfolio, learning HTML is the only way for me to customize everything that I wanted to create. Page layouts, making tables, setting up images, and an endless slew of options give you the ability to create almost anything in just notepad. HTML Writer attempts to do what Adobe has done with Dreamweaver, and gives you an iPhone version of Programmer’s Notepad. 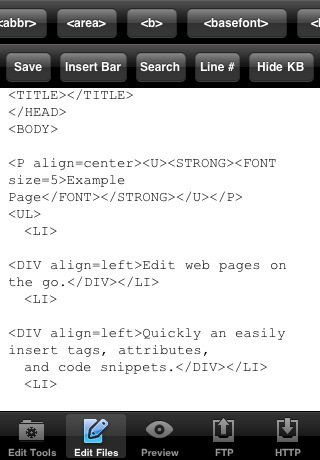 Created by Ron Wheland, HTML Writer is available for the iPhone, iPod touch, iPad for $2.99. This little utility app does more than meets the eye. Create a new file and start editing. Basic tags such as the head and body are entered already and you just start from there. I sometimes come up with random ideas when it comes to scripting. Usually, I’m not near a pen and paper or I’m not at my computer. It happened when I was using Actionscripts for Flash. I’m not sure how many of you readers are like that, but trust me, it’s tough to write that kind of stuff out. HTML Writer can give you the ability to set up some scripts and preview it immediately or send it to your website’s FTP server for immediate publishing. There are tons of tag buttons at the top of the screen that can set up tons of different tags for you at a touch such as line breaks or making text bold. Due to the size of the iPhone, I had to hide the keyboard constantly to view my script, but overall, it was pretty intuitive. The biggest issue with this app is that if you have NEVER used HTML or want to learn, this is a completely useless app for you. If you want to start and get tutorials, get books or find online tutorials. This is not a teaching app; it’s a tool for people with a previous intermediate or advanced knowledge of HTML scripting. Some important updates that I really look forward to in this app are the ‘Find’ and ‘Find and Replace’ features. When you have pages worth of scripts, when you have to replace several words because of some error you made, ‘Find’ and ‘Find and Replace’ functions are time savers. Unfortunately, this app has yet to implement this key feature. I’ve barely began my HTML learnin’ so it was actually educational for me to see some script tags listed conveniently at the top of the screen. This was an excellent tool to see and be amazed at. Website previews, FTP connectivity, customizable tag shortcuts, download scripts off the internet, and being able to email yourself your work brings this lovely app to way above average. If you are an HTML-savvy person, try this one out. 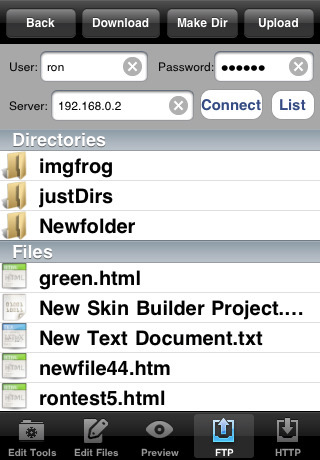 AppSafari review of HTML Writer was written by Joseph Ho on October 28th, 2010 and categorized under App Store, Developers, Files, Notes, Utilities. Page viewed 6567 times, 1 so far today. Need help on using these apps? Please read the Help Page. Wow nice recommendation, CSS Library is another amazing resource for web designers. Hi, I am the developer of the app and I know this review is from years ago but I still feel like saying thank you for the review and in case anyone is wondering, find and replace (among many other new features) have since been added.